LOCATED between the beautiful coastal towns of scituate and cohasSet, The River Club is A PRIVATE VENUe for your south shore Dream wedding. We offer almost unlimited flexibility when planning your wedding. From the food, bar, timing, layout, and arrangements. This combined with the fact that you'll be working directly with the owner, Angela, you'll be surprised how her 40+ years experience delivers unrivaled value and affordability. We only host one wedding per day and you choose the time. We don't charge a room or ceremony fee, our pricing is simply based on your food and bar choices. If there's something extra that we don't have, we're happy to work with you to get it. For outdoor ceremonies, you're sure to love our beautiful pavilion and cinderella stairs. We've also incorporated twinkle lights into our manicured grounds for a special evening ambiance. 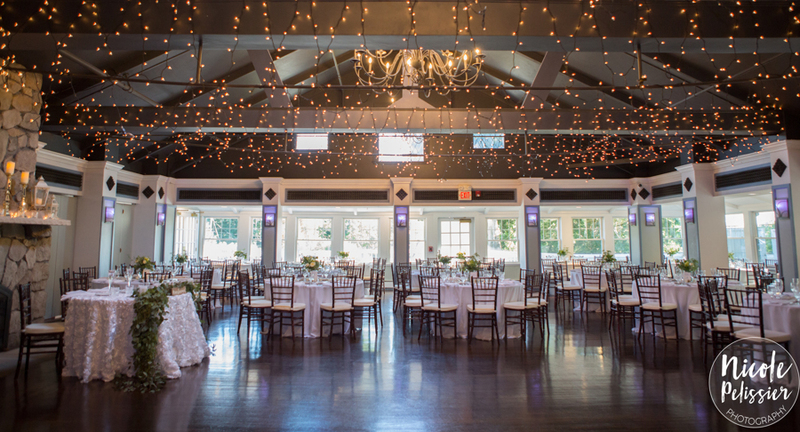 For indoor ceremonies, our magnificent stone fireplace, chandeliers, hardwood floors, and vaulted ceilings create a romantic and unforgettable experience, for you and your guests. At The River Club, you will also appreciate our cocktail room with a fireplace and baby grand piano, our rustic bar, wrap around deck, and stage for entertainment. Check out our galleries to see how beautiful your day can be. We know that weddings are often multi-day events. That's why we've compiled a list of accommodations and things-to-do around the South Shore to help you visualize and plan your guests experience. From lodging, to beaches, and to award winning restaurants down the harbor.